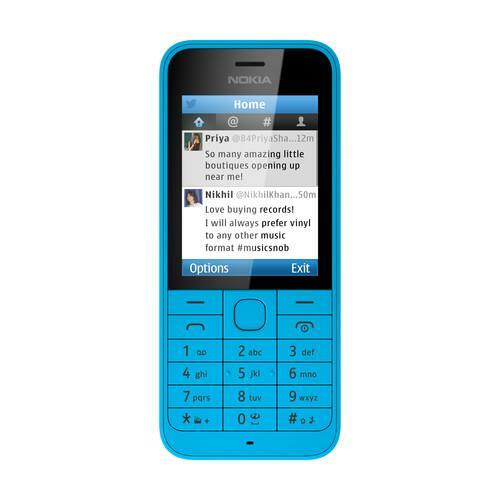 The Nokia 220 has comes with a Twitter app. The big news from Nokia at Mobile World Congress was its Android-based X family, but the company also launched the Nokia 220 feature phone and the Asha 230. Sales of smartphones accounted for 53.6 percent of overall mobile phone sales last year, and exceeded annual sales of feature phones for the first time, Gartner said earlier this month. But while a growing number of users are choosing to buy a smartphone, Nokia thinks there is still room for feature phones. The Nokia 220 is an "Internet-ready" mobile phone that costs €29 (US$40). It has a numerical keyboard, a 2.5-inch screen and a 2-megapixel camera. On the software side, Facebook and Twitter are preloaded and Microsoft's Bing is the default search engine. On advantage with feature phones -- especially in parts of the world where electricity isn't always easy to come by -- is the battery life. The 220 has a standby time of up to 29 days and it can play music for up to 51 hours. The 220 will go on sale immediately with a single or two SIM cards in Asia-Pacific, Europe, India, Latin America, the Middle East and Africa. Nokia also launched the Asha 230, which is the cheapest member of that family yet at €45. The Asha family has struggled to compete with entry-level smartphones based on Android for some time. Even though Nokia now has devices based on the Android Open Source Project of its own with the X family, the Asha products will live on, according to Stephen Elop, executive vice president for Devices & Services at the company. The Asha 230 has a 2.3-inch screen with a 320 by 240 pixel resolution and a 1.3-megapixel camera. It comes with applications such as Line, WeChat and WhatsApp. Also, with a forthcoming software update, the Asha 230 get 7GB of free storage on Microsoft's OneDrive, and the option to automatically back up photos to the cloud. That integration will also be available on other Asha models via a software update in April. The update will also include Nokia's music service MixRadio. The Asha 230 will also be available immediately across Asia-Pacific, Europe, India, Latin America, the Middle East and Africa. Nokia's plan is to offer four tiers of products, starting with entry-level devices like the new 220, followed by the Asha touch phones, the new X family, and finally its Windows Phone-based Lumia portfolio at the top. Nokia's low-end products will face even tougher competition, as more vendors increase their efforts to bring down the cost of smartphones. For example, Mozilla on Sunday announced a collaboration with chip maker Spreadtrum to develop Firefox OS-based smartphones for about $25.